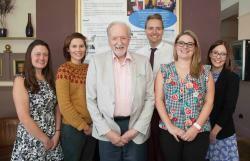 Bangor University, in partnership with Flintshire Social Services, and the renowned author John Killick has recently celebrated their latest project in supporting people with dementia - Creative Conversations. 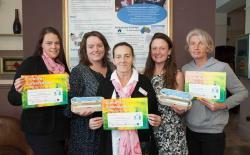 The project worked with fourteen Flintshire Care Homes, offering their staff creative workshops to offer new and alternative techniques to support people living with dementia and to help stimulate conversations with them. These sessions used the arts and other creative techniques to better ensure that people living with dementia have a positive and meaningful interaction to support their wellbeing. The workshops helped to upskill the care home workforce so they have the techniques to support people living with dementia and to make connections and friendship while they go about their day-to-day activities. 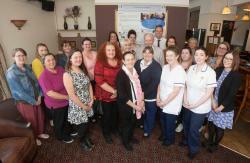 The celebration event was held at the Horse and Jockey Pub in Buckley, which was accredited as “working towards becoming dementia friendly” in the Buckley Dementia Friendly Awards. 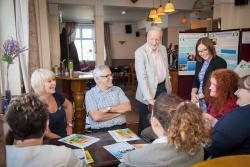 The Horse and Jockey Pub was also was one of the venues for the workshops. Following the success of the project, Flintshire Social Services have secured additional funding to continue the workshops for care homes throughout Flintshire to develop the opportunity further by including family carers and those who work within home care agencies across the county.